Now WE can have our Whoppers too! Updated 13th May 2010 – Burger King is opened for business. Launching ceremony to be on 23rd May 2010. 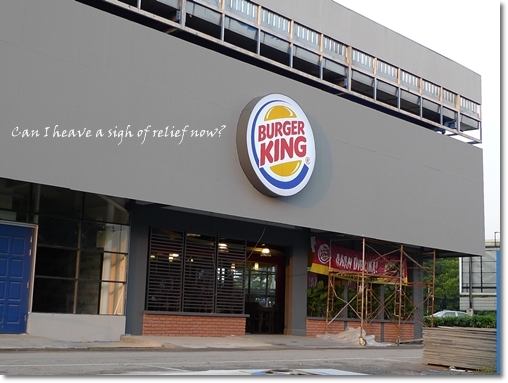 Yeah, Burger King is FINALLY opening their maiden outlet here in Ipoh. Or Perak for that matter. Timely, for this particular fast food franchise has been one of my personal favourite ever since I sank my teeth into a Whopper back in those days at their outlet in KLCC. I had a hard time forgetting the delicious “whopper” of a beef burger (pun intended), served with crispy fries (almost on par with McD’s and miles better than KFC’s) and refillable soft drinks, albeit the combo sets were (and still are) priced slightly higher than the average fast food outlet. Notice that back then, Carl’s JR, Wendy’s, Cristang, Nambawan, Daily Grind etc were NOT on our shores yet. Okay, maybe Wendy’s (the old one) was, but I have no recollection whatsoever on the burgers they served. Especially us poor souls in Ipoh, with only McDonald’s, KFC, Grandy’s (fond memories?) and A&W (which had since vanished into thin air ...) to satisfy our cravings. De Garden of Ipoh currently houses only a few eateries, and plans to develop the place into THE most chic and happening hotspot in Ipoh are going well, save for some trivial (okay, some not so negligible) spanner in the works. One being the dire needs for extra parking spaces around the area. They probably did not foresee this as a problem initially, but come festivities (the recent Chinese New Year was a really good example) or public holidays, and the headaches come in waves. And no, it’s not so much coz of the booze. 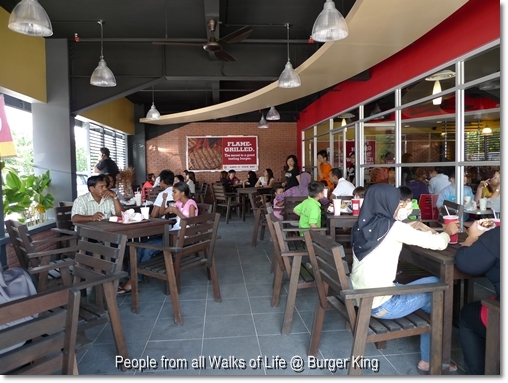 Thankfully Burger King opens at the former Courts, facing Jusco Kinta City. (Courts have since relocated to the Ipoh Garden roundabout, where Hoi Seng Restaurant is) And they offer Drive-Thru services as well, so you don’t have to pull your hair out if you can’t find an empty parking lot. ** Other F&B Outlets @ De Garden – Ayam Penyet – AP, and a new fresh frozen yoghurt (desserts) chain-outlet named Tutti Frutti (more on that soon). And Wong Kok Char Chan Teng (a chain of restaurants in Klang Valley serving Hong Kong-style cuisine) is rumoured confirmed (just saw the banner tonight) to be opening soon, in June 2010 at De Garden as well. So happy for u lah, haha!!! Congrates to Ipoh. Kuching doesn’t even have Burger King. Yay, congrats to the Ipohans for their first BK outlet!!! Hey wyyv, I highly doubt I will write about their burgers, as I seldom write about fast food. But let’s see what I have missed after so long of staying away from BK, even in KL. Thanks lolento. You mean at De Garden as well? From their site, supposedly even Su Chan, with the famous tiramisu (seemingly supplied to Alexis, hence the resemblance) will open an outlet here. Let’s all hope and pray. And time is nigh for a Nando’s, Carl’s JR, Subway, and Wendy’s to start somewhere in Ipoh…. I am a little sick of the usual McD, KFC and Pizza Hut when it comes to fast food. Meaning this is very near to McD’s 24 hours drive-thru on the same Jalan Gopeng? Ya. It will be a one storey building that housing KFC 24 Hours with Drive-Thru and Pizza Hut at the old Shell Petrol Station land there, just beside Public Bank!!! Yeah.. San Francisco Steakhouse located @ Coliseum Square due to open most probably this month or next.. The signage is already up on that building.. Yum2..
Btw it’s also next to Royal China Restaurant (Tai Thong group of restaurants chain) shifted frm Heritage Hotel..
Lurve the cosy ambience there..
Yea I was in primary school during Grandy’s days in Ipoh. Refilled like crazy. Now in my thirties, limit sugary beverage to one glass of coffee per day. Scared diabetic and other ailments. You know, I kind of liked Grandy’s cinnamon rolls a lot, though I have no recollection whatsoever of their fried chicken. Funny huh? 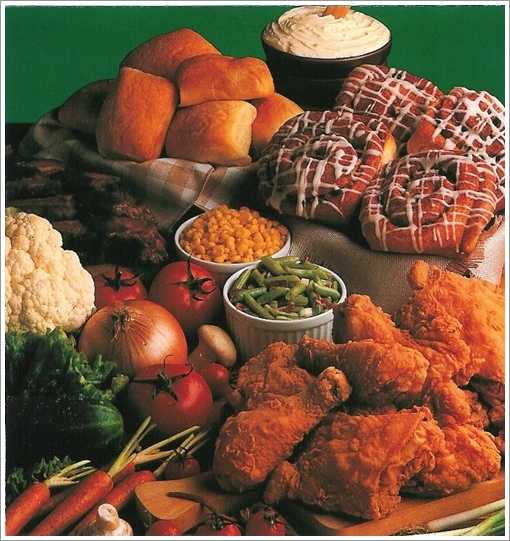 But still, weekend dinners at Grandy’s remained as sweet memories from the 80’s … or was it 90’s? Let me share my experience with Burger King’s drive thru service today. Firstly, the layout is quite poor. The road is narrow and you need to come from the D’Garden end. Took me a good 20 minutes+ to get to the payment counter. Secondly, unlike McD’s, they don’t display their full menu before the ordering kiosk. I had to ask about Mushroom Swiss as they did not have it on their menu’s. Thirdly, the ordering kiosk is not interactive. I do not get to check my order and what my total payment is. I asked for the total and the total the guy at the ordering kiosk gave me did not tally with the total when I reached the payment counter (RM15+ went up to RM17+ for a Mush Swiss Double medium meal apparently because i requested for coke light instead of normal coke). What truly took the piss was they told me they ran out of fries. YES!!! They tell me when I pay, not when I order. The reason given was that they source their fries from KL. Hmmm… I wonder where McD’s sources their fries from? Kampar? Bidor? Bercham? I don’t recall McCain’s operating potato farms there. VERY POOR inventory management. They had the cheek to offer me onion rings instead. Given the nonsense I had to put up with, not getting the amount right, no fries etc., I told the cashier she can keep her fries and burger and I headed down to McD’s instead. Got myself a good old trusty McSpicy medium meal with no extra charge for Coke Light all for under RM11. Saved RM6. I almost felt like ordering some McD’s french fries for delivery to the BK drive thru payment counter just to take the piss. An aside, something I have noticed from my time living in UK and Singapore is that the Malaysian burgers are smaller than UK and Singapore. Also, the price differential between McD and BK in Singapore is S$1-S$1.50. In Malaysia, it is as much as RM5-6. I think this simply reflects managerial ability. With the BK franchise in Malaysia being run by a private equity firm, penny pinchers unfortunately prevail over the customers as demonstrated by my above experience. My prayers are heard! Can’t wait to return to Msia then! A&W is making a comeback. Opening soon in Tesco Station 18. Hi koo, they’re already opened. Do hop over and taste the same old great taste of Root Beer and Waffles? Let’s hope the quality does not dwindle. I have had bad experiences with A&W in KL before though.